Former Posh goalkeeper Mark Tyler. 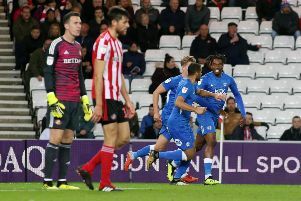 In 486 appearances for the club, it’s inevitable that goalkeeper Mark Tyler has good and bad memories of FA Cup ties with Posh. Tyler was thrilled to be in goal when Posh were demolished 5-0 by Chelsea at Stamford Bridge in 2001 (he was too modest to mention the 10/10 mark he picked up in the Evening Telegraph after his awesome display in a 1-0 win at Oldham earned that lucrative tie) and he was proud to be part of a memorable live TV game the following year when Newcastle won a stunning game 4-2 at London Road. But he also remembers the bad nights and one of the worst arrived in November 2005 when Posh were dumped out of the FA Cup at then non-league Burton Albion. Mark Wright was the Posh manager then and Burton were bossed by an old Liverpool team-mate Nigel Clough. “It was a terrible night for the club,” Tyler recalled. “It was freezing cold, we played terribly and we were beaten. “A couple of rounds later Burton were playing Manchester United home and away which didn’t improve the mood! “We were a strange team in those days. We had some good players, but we were very inconsistent. We used to train at Peterborough Northern Star’s ground at Chestnut Avenue which didn’t help. “But we were happy with the draw in the FA Cup as Burton were a non-league team and we were at home. “I don’t remember much about the first match which finished 0-0, but I don’t think I had a lot to do in either game. “They eventually scored the winning goal late in the second-half at Burton and we never threatened to equalise. “It probably didn’t help Mark Wright’s job prospects, but I thought he was a decent manager. “He was certainly very professional in terms of game preparation. You could tell he had spent a lot of time at big clubs in his playing career. He just lost his way a bit towards the end of his time with us. “I don’t remember him getting too angry after we lost at Burton. It was a very quiet dressing room after the game as everyone wanted a good FA Cup run. I was lucky to be involved in a few at Posh. The game at Stamford Bridge was a real thrill despite the result as we were on the same pitch as Zola, Poyet, Terry and Hasselbaink and the tie at home to Newcastle was fantastic to play in. “That was the game when Dave Farrell scored a great goal and the TV cameras caught him singing ‘there’s only one David Farrell’ along with our fans! Tyler is the second highest Posh appearance maker after Tommy Robson. He still lives in the city, but his focus now is on helping Luton to promotion from League Two. He’s also keen on an FA Cup run. Luton are away to Crawley in the first round. “It’s going well at Luton,” Tyler added. “I really enjoy it there. I went there when they were a nonleague expecting to be back in the Football League within a season, but it took us five years to win promotion! Every season I sit down in front of the FA Cup draw and hope that Luton get drawn away to Posh as I’d love to come back one more time. I’m 38 now and I’m having to fight for my first team place as Luton have an excellent young goalkeeper, but I will play for as long as they want me. “John Still (Luton manager) gave me my Posh debut all those years ago. “He’s calmed down a bit since then. He’s more knowledgeable now and I’m sure he can get us out of League Two. “It’s a tight league with no really outstanding teams and a strong run of results would soon get us into a challenging position. “We signed Craig Mackail-Smith in the summer and he has been excellent.